For whatever reason, I find that making a beforehand bite... is often an after thought. Perhaps this is because most our evenings don't involve an appetizer course. And... when having guests... I tend to concentrate on the main course, a soup or salad starter... and even a dessert. It's usually not until an hour or so before the doorbell rings that I realize I don't have a nibble to enjoy with cocktails and I then scramble to pull together a quick fruit and cheese plate. This little appetizer, I suppose, is really just a dressed up cheese plate... so it completely falls within my wheelhouse. It's a little twist on a tomato-eggplant-artichoke bruschetta we enjoyed a while back at a local winery. The difference here is... absolute ease. I always seem to have all... or most... of these ingredients. It's a nibble that comes together quick and easy. 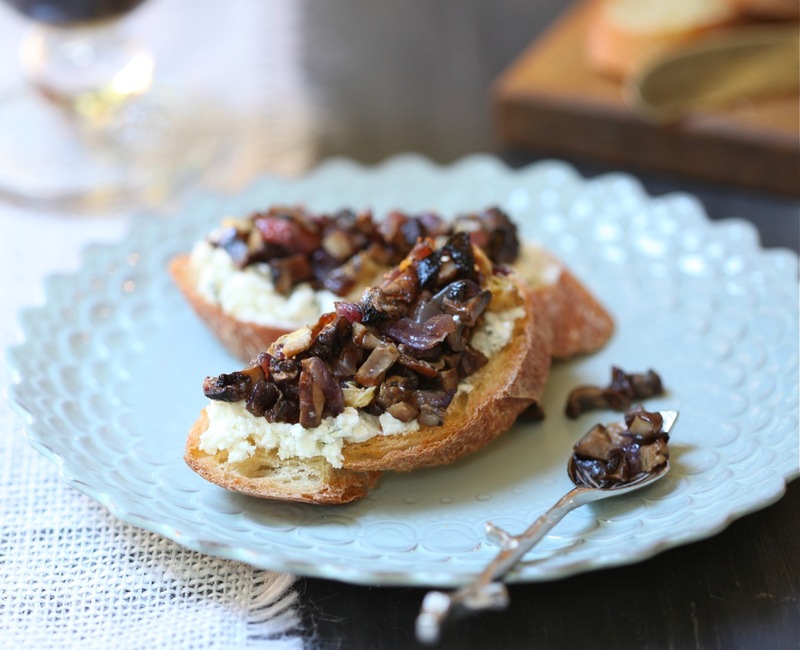 The toasts can be slathered with a little cheese spread and tapenade... or a bit of just one. And, best of all, it can be made well in advance and doesn't require exact precision... a little more or less of this or that truly doesn't matter. 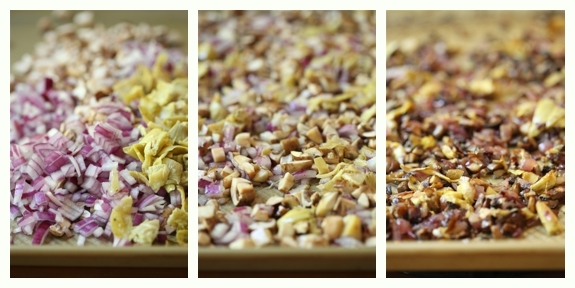 The veggies... red onion, marinated artichoke hearts and mushrooms... get a quick chop, toss with some olive oil, salt and pepper, and pop in the oven for a 20 minute roast... infusing your kitchen with a delicious aroma as they do their thing. 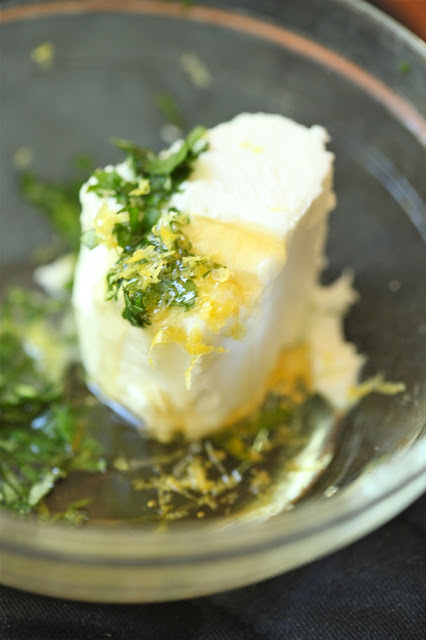 The spread is goat cheese roughly mixed with a drizzle of fresh lemon juice and honey, a sprinkle of lemon zest, and a touch of chopped basil. Then, right before everyone arrives, the bread gets popped in the oven for a quick few minutes to toast... while at the same time, you secretly toast to the fact that you didn't forget the appetizer. Preheat oven to 425 degrees F. Spread chopped mushrooms, artichokes and onion on a sheet pan; drizzle with olive oil and season with salt and pepper. Toss to combine and spread veggies into a single layer. Roast in oven for approximately 20 to 25 minutes, until golden (red onion slightly browned). Taste and season with additional salt and pepper, if necessary. 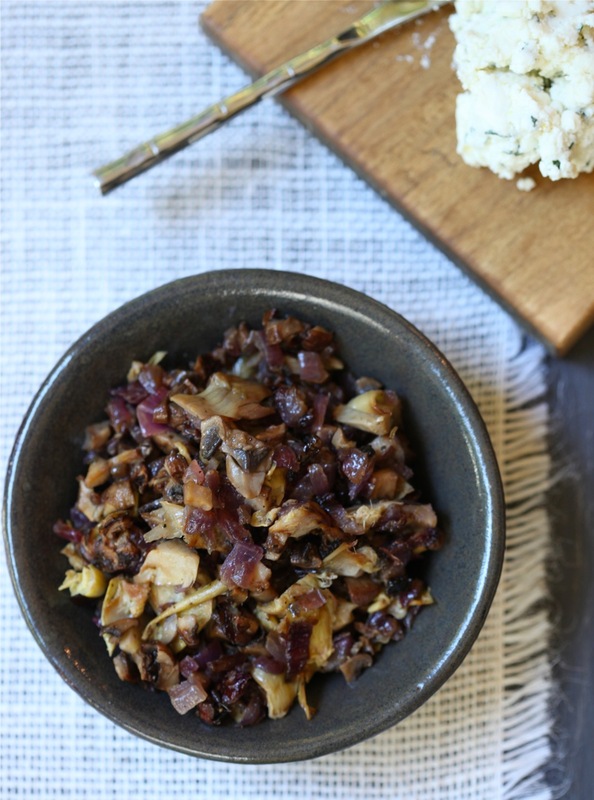 Tapenade can be placed in fridge and removed approximately 1/2 hour prior to serving to allow to come to room temperature. For cheese spread, combine all ingredients in a small bowl and mix through using a fork. Spread can be covered with plastic wrap and placed into fridge until ready to serve. To make toasts, lightly brush tops of each bread slice. Place on a sheet pan and bake in a 350 degree F. oven for approximately 5 minutes, until lightly golden and toasted. Serve with tapenade and cheese spread.